Here's a quick recap of Day 30 on Health Made Simple plan from No Meat Athlete! I started with an Ah Fudge Nuts Picky Bar (made with dates, peanuts, and other whole foods), and then I headed for bootcamp at my gym. After the workout, I had a banana for carbs! Breakfast was a Strawberry Banana Smoothie (made with strawberries, banana, spinach, walnuts, chia seeds, and flax seed). My morning snack was another fruit bowl. I'm still not tired of fruit! It makes me feel so good. This one had blackberries and apple slices. Lunch was another Buffalo Tofu Ranch Wrap, enjoyed on the patio at Crosstown Concourse (where I work). It was such a nice day, and I figure it's one of the last few warm days we'll have! This has baked tofu, cashew ranch, hot sauce, lettuce, pickled onions, celery, and cherry tomato. 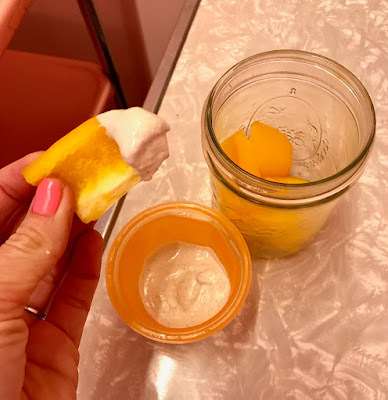 Someone asked in the comments yesterday if I could share the cashew ranch recipe, but it's not mine! It's part of the HMS meal plan, but it's very similar to the recipe in the No Meat Athlete Cookbook (so if you have that, give it a try!). Afternoon snack was Whole Wheat Crackers & Celery with Almond Butter. I didn't have a side with my wrap so I was pretty hungry by 4 pm. For dinner, I met up with our Memphis Vegan Drinks group at City Silo. I chose this whole foods-based restaurant for our meetup this month because I knew it'd be meal plan-friendly. I ordered The Roots Bowl with roasted sweet potato and beet, red onion, bell pepper, quinoa, brown rice, avocado, and tahini sauce. So good! Washed down with a Crosstown Brewing Co. Traffic IPA because Vegan Drinks! That's it for Day 30! Another successful day. I love having whole foods all day and ending with a satisfying beer. 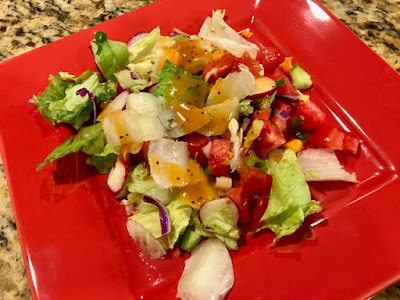 Day 29 on Health Made Simple (hard to believe I've been doing a meal plan for 29 days now!!!) was just perfect! I'd planned on getting up early and going on a neighborhood walk as my daily workout. But when my alarm went off, I just wasn't ready to get up. So I changed my wakeup time to 6 am and slept in! I rarely ever do that, but it feels so good when I listen to my body and respect how much sleep it needs. Needless to say, I felt well-rested when I finally got up and enjoyed this Mango Jalapeno Smoothie (mango, banana, jalapeno, and walnuts). Love that little hint of spice! Morning snack was Bell Peppers and Cashew Ranch. 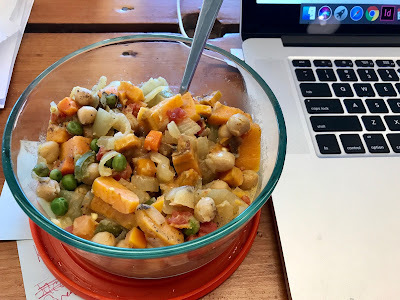 And lunch was leftover Sweet Potato & Chickpea Curry, enjoyed while working at my desk. Mondays are very busy at work so I typically work straight through lunch. Afternoon snack was another awesome fruit bowl. 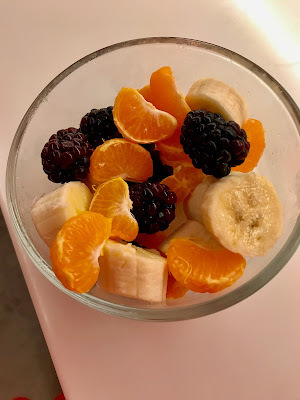 This one has blackberries, clementines, and banana. I did finally get that walk in after work. Paul and Maynard joined me. We walked for about 45 minutes (in my new trail running shoes!! I should be back to running very soon!). Maynard is terrible on a leash and pulls the whole time, but he certainly enjoyed his extra-long walk (our usual dog walks are more, like 10-15 minutes). 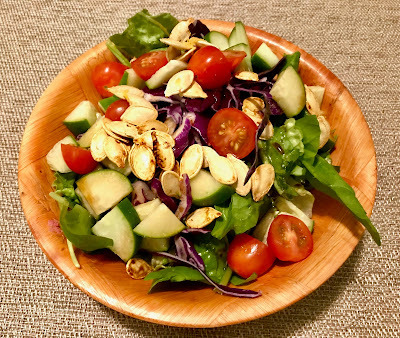 When we got back, I made a quick salad with romaine, cherry tomato, cucumber, red cabbage, and toasted pumpkin seeds (made from our jack-o-lantern) with a teensy bit of olive oil and some balsamic vinegar. Matt from No Meat Athlete/Health Made Simple recommends having a salad every night as a snack while you're preparing dinner. Such a great idea! 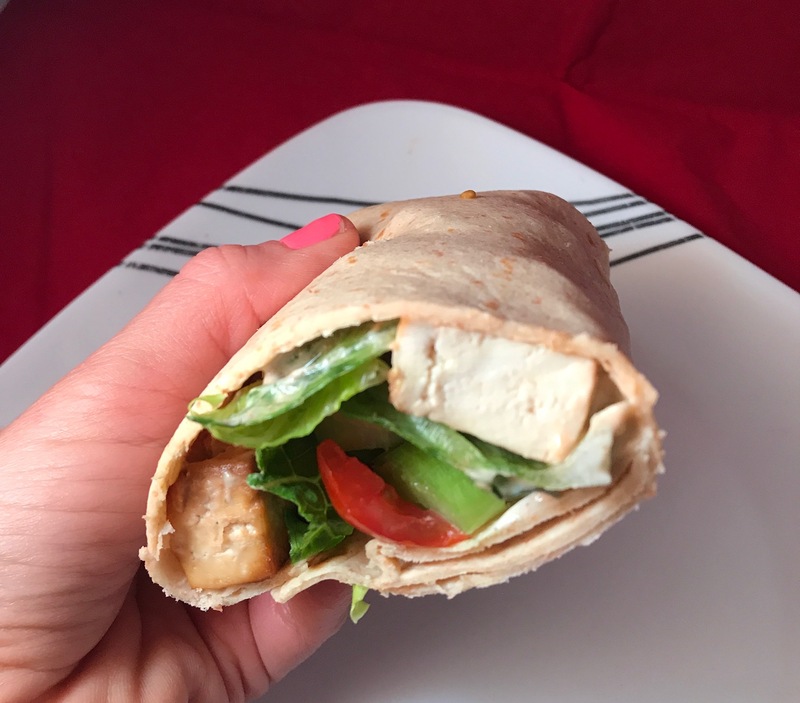 As I snacked on that salad, I prepped the tofu and veggies for my Buffalo Tofu Ranch Wrap. In case you're wondering, Paul made a pizza for himself. This HMS recipe has baked tofu, cashew ranch, hot sauce, celery, cherry tomato, romaine, and pickled onion. Seriously so good. This recipe is definitely a keeper! 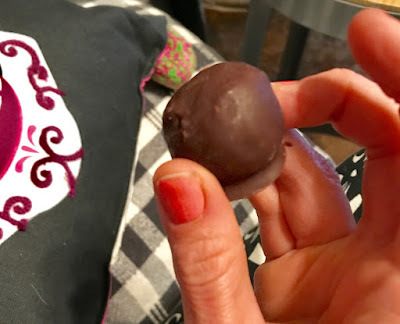 I got a chocolate craving after dinner, as we were watching Netflix. So I had my last Skinny South Strawberry Truffle. These are locally made cacao truffles sweetened with stevia. Only 25 calories! And very tasty. Another successful weekend on the Health Made Simple plan (well, sort of — I definitely had some beer and brunch treats, but overall, I ate really well). Thursday morning started with another banana walnut smoothie (no pic), followed by a morning snack of fruit at my desk (plus, some extra-strong coffee because I was extra-sleepy on Thursday morning — trying to stick with one cup a day, but sometimes, I need that extra boost). Lunch was another Orange Tofu Tahini Wrap with baked tofu, mandarin oranges, tahini, pickled onion, red cabbage, and romaine. I made some Roasted Potato Wedges (from the Health Made Simple plan) on the side. They're oil-free! 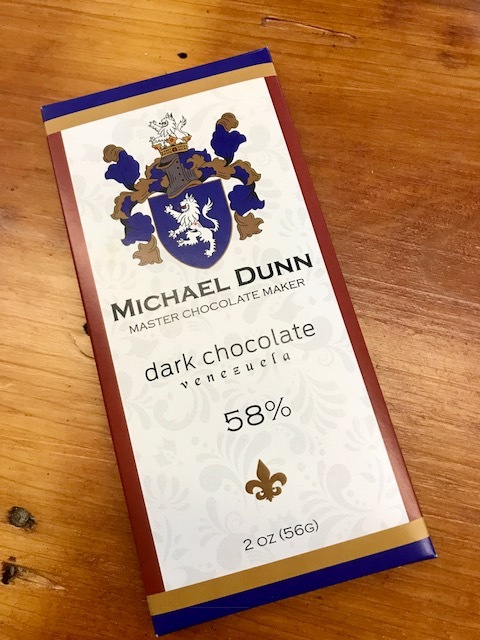 In the afternoon, my co-worker Madelyn gifted me a yummy chocolate bar (she's gotten a huge shipment of chocolate from her sister, who co-runs this chocolate company with her husband). 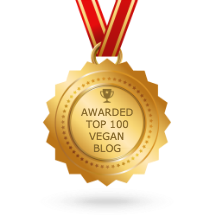 As far as I'm concerned, dark chocolate is the healthiest/awesome-ist dessert you can have! I also snacked on crackers and hummus that afternoon, followed by a dinner of Lisa's Lentil Soup from the HMS plan. A solid, tasty lentil soup on a cold night! This had spinach, tomato, and quinoa. Friday morning started with bootcamp (after a pre-workout Larabar)! I haven't been to bootcamp since I fractured my foot, but it's doing much better. And I was able to take the class with a few modifications (no jumping jacks or high knee touches). After my workout, I had my little white rice post-workout snack. And then later, my breakfast of a greens-fruit-flax smoothie (no pic). Morning snack was a fruit bowl, and lunch was leftover lentil soup. Afternoon snack was baked corn chips (made in the air fryer using homemade tortillas) with salsa. Dinner on Friday night was super weird, but it was really good! We had Veggie Burger Tostadas on the plan. They recommended the more whole foods-y burgers, like Sunshine or Dr. Praeger's. I went with Sunshine because they only have a handful of ingredients that are all real foods! Served on a corn tortilla with ketchup, mustard, cashew cheese, and pickled onion. The whole thing went in the broiler, so it browned the cashew cheese and made the tortilla all toasty. I had a salad on the side. 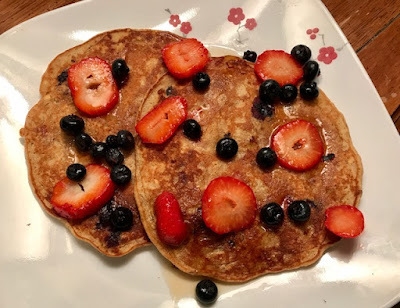 On Saturday morning, I woke up early and made gluten-free Whole Grain Pancakes (oat, almond, and chickpea flour) with berries and maple. We had a Crosstown neighborhood clean-up that morning, so these kept me satisfied for that. The clean-up crew met and ended at Crosstown Brewing Co., so of course I had to have a post-clean-up beer (at 11 am, why not?). Then I headed home and made a snack of a banana-walnut smoothie. Lunch was another veggie burger tostada, and then I cleaned my house and ran some errands (snacking on a fruit bowl in the car). 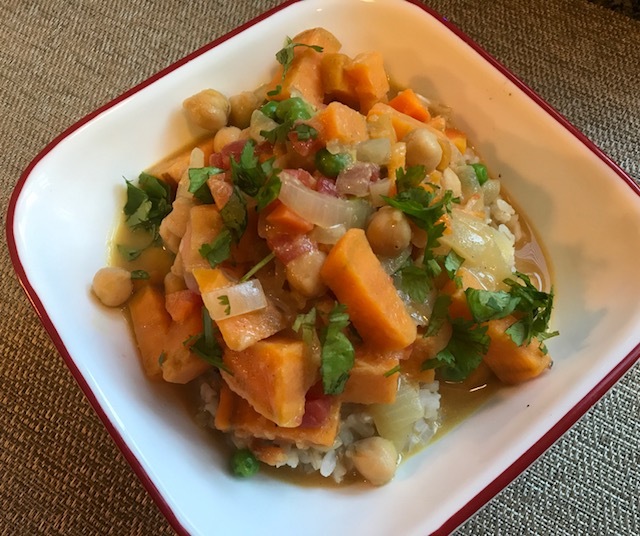 Dinner was Sweet Potato & Chickpea Curry over brown rice. This was sooooo good! It had a coconut milk base with tomatoes and peas. Yum! That powered me through the rest of the night, which was spent attending a few Halloween events. I went to the Crosstown Booo-zy Bar Crawl and the Black Lodge Halloween Ritual party — all within blocks of my house! I dressed as a New Kids on the Block fan because I just bought tickets to see them (with Salt-n-Pepa, Tiffany, Debbie Gibson, and Naughty By Nature) in May! Here's me with a GLOW wrestler (Megan) and Spiderman (Paul). I had several beers that night, so it was great to wake up on Sunday to a cleansing fruit bowl! This had banana, plums, and strawberries. I kept it light because we had brunch plans Sunday morning. We met some friends at Fuel for our pal Don's fourth Lulu's Pop-Up Brunch. This one had a mushroom theme (mushroom steak and tofu eggs were on the menu!). 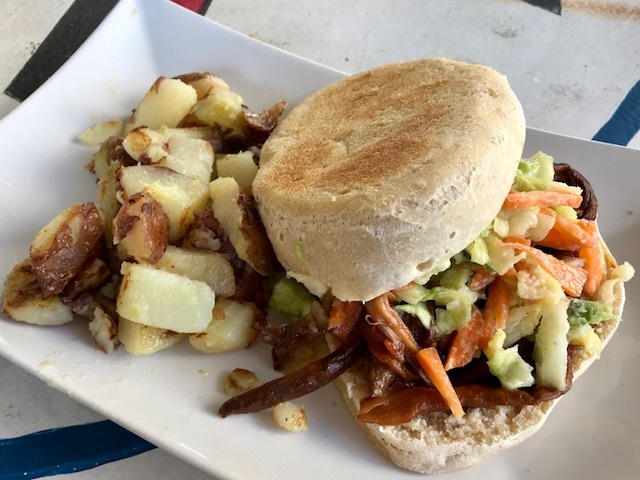 I went with the Brunch BBQ Sandwich with smoked BBQ oyster mushrooms and slaw on a homemade English muffin. Side of crispy potatoes. So good! Paul and I brought our own champage for mimosas too because brunch! Still pretty whole foods-y for a meal out, right? Sure, it had white bread, but it was handmade by Don, a master baker. Totally worth it! My afternoon snack was bell peppers with cashew ranch. And finally, for dinner, Paul and I had another HMS entree of Portabella Mushroom Ragout over whole wheat spaghetti. This homemade (oil-free!) 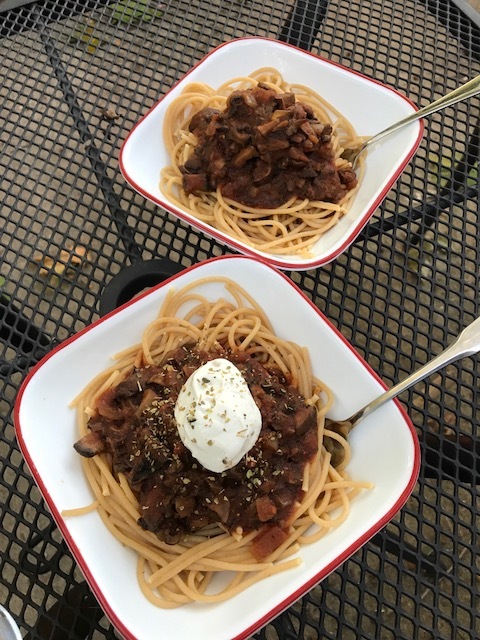 sauce was loaded with portabella mushrooms. SO GOOD. I topped mine with a little cashew cheese. We ate this on the back patio since the weather was so lovely last night. Another great weekend gone by! Another successful day on Health Made Simple (and this one involved doughnuts and vodka!). The the day started with my usual Wednesday morning spinning class at the Y. Before a morning workout, I typically have a Larabar, some dates, or another whole foods-based light snack. This time, that was two Emmy's Organics coconut macaroons. 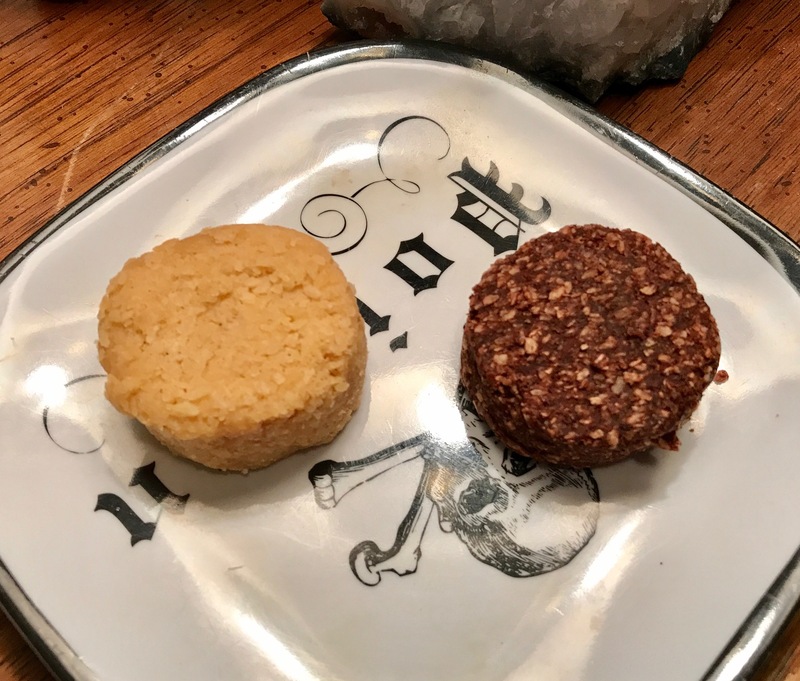 One was vanilla bean and the other cacao — both made with coconut flakes and agave. I've refined my pre- and post-workout quite a bit since starting Health Made Simple a few weeks ago. Before, I would often have a Clif bar or some other high-sugar, highly processed food bar. 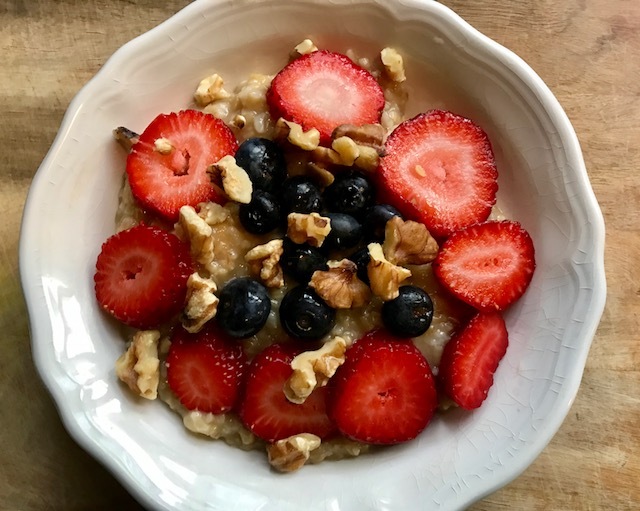 I'm now understanding that not all sugars are made the same, and while a high-carb snack is good before a workout, the best one is made from whole, natural foods. I've also refined my post-workout! Before, I thought I needed a ton of post-workout protein. But according to Sid and Matt on Health Made Simple, it's more important to have a high-carb snack immediately following a workout. They recommend a banana, fruit juice, or white rice. 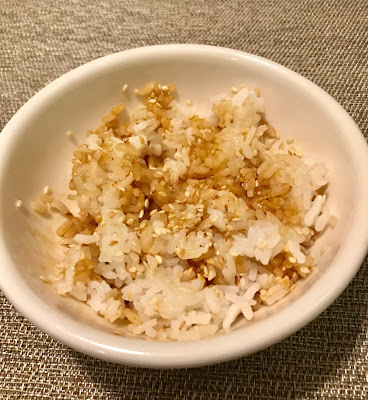 I'll take any excuse to enjoy white rice, so that's what I've been having — with a little soy sauce for flavor and some toasted sesame seed for fat. Sorry for the bad photo, but the sun hadn't risen yet. My days start very early (4:30 am yesterday!). So that's how most of my days have been starting — fruit/nut-based snack and white rice. I follow the rice snack immediately with coffee and then with my morning smoothie about an hour later. Yesterday, that was a Green Fruit Flax Smoothie (apple, flax, banana, spinach). I forgot to take a pic! Morning snack was another fruit bowl (and I forgot to photograph that too!). Andddddd .... well, also a Pumpkin Spice Brioche Doughnut! Not on the plan obviously but our pastry chef at Today & Always (the eatery inside Crosstown Arts) made vegan doughnuts so I had to have one. I will never let a doughnut opp pass me by. But I did something I'm very proud of. I cut the doughnut in half and enjoyed half. And then I stopped to reflect on how I felt. I asked myself if I was satisfied or if I needed more, and honestly, all that sugar made me feel a little wonky (despite how great it tasted!). So I figured half was plenty, and I GAVE THE OTHER HALF AWAY! That's a big step for me. 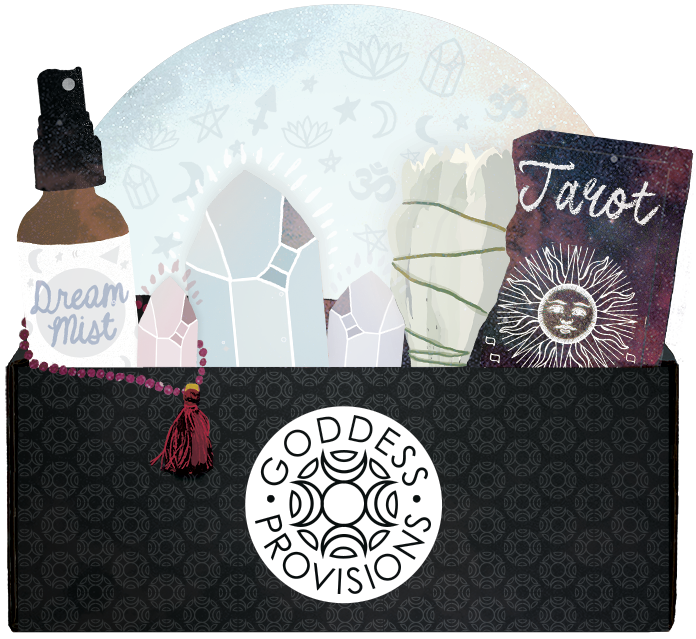 I'm learning not only how to listen to my body (hello, intuitive eating!) but also how to share food (something I've never been good at). 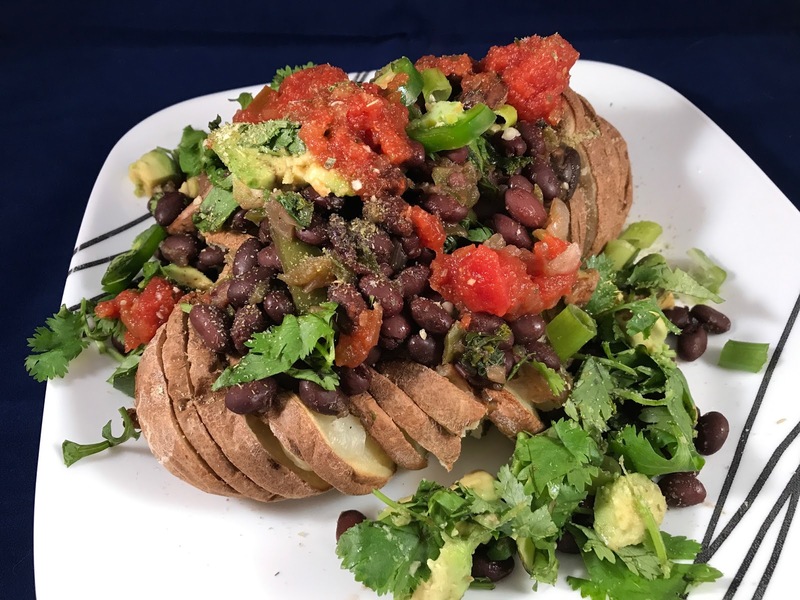 Lunch was a leftover Dressed-Up Southwest Baked Potato with black beans, cilantro, scallion, jalapeno, nooch, and salsa. Very good. Very filling! My co-workers were very impressed with this lunch. We had Crosstown Running Crew at 5:30 pm, so I rushed home and downed a quick meal plan snack of Whole Wheat Crackers with Hummus & Veggies. I'm still not able to run (SADNESS), but I organize our running crew, so I had to be there. My friend Megan, who typically comes to run with us, is nursing an injury too. So she and I rented Explore Bike Share bikes and rode (while everyone else ran!). Afterward, we always hit up a bar in Crosstown Concourse, and last night, that was Art Bar (the new bar inside Crosstown Arts, where I work). 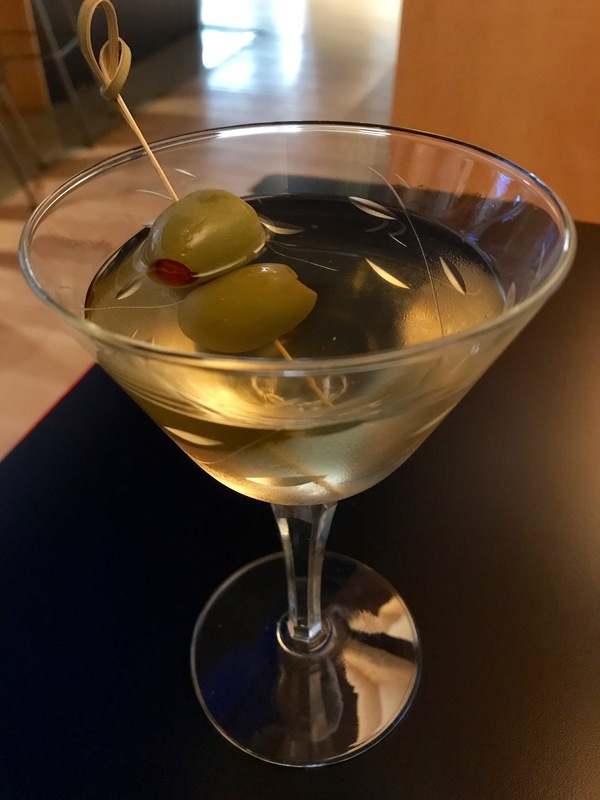 I enjoyed one very delicious Dirty Martini. I love being able to enjoy a few drinks or a dessert without guilt! Knowing that the rest of my day is filled with veggies and fruit makes me feel pretty darn good about a martini and a half a doughnut! After drinks, I went home to make a quick meal plan dinner of this Orange Tofu Tahini Wrap with a side salad. 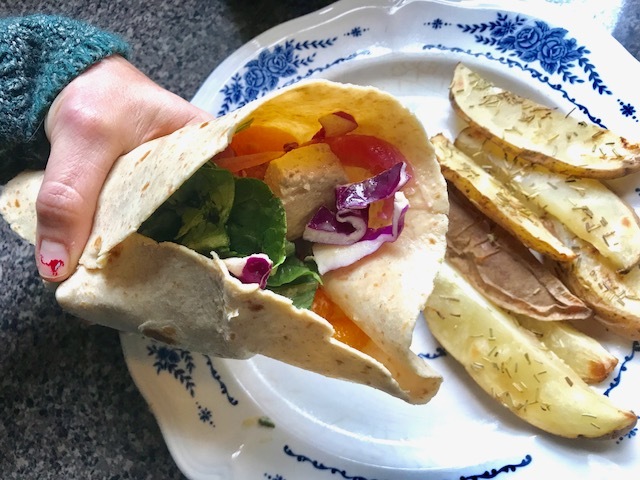 This recipe sounded very weird (baked tofu, tahini sauce, mandarin oranges, red cabbage, lettuce, and pickled onions stuffed into a wrap), but the flavors paired SO WELL together. Will definitely be making this again after this meal plan wraps up! Here's a quick recap of what I ate on the whole foods, plant-based Health Made Simple yesterday! My mom was still in town (she spent two nights at my house to help me paint) that morning, and she's not into smoothies. So we had the same Steel Cut Oats bowl we had the day before with banana, maple, strawberry, blueberry, and coconut butter (no pic cause it looked the same as in yesterday's post). Morning snack was Baby Carrots & Celery with Goddess Dressing (made from a recipe on the plan — tahini, scallions, garlic, and parsley). My mom stayed at my house and did some final painting touch-ups on my hallway doors while I went back to work. And she had plans to head back to Arkansas around noon, but first she met me for lunch at Today & Always (the plant-based eatery at Crosstown Arts, where I work in communications). I ordered the Cauliflower Steak (served over mashed potatoes and steamed green beans, topped with chermoula). I'm going off meal plan for occasional meals out (especially at Today & Always because the food is amazing and all very healthy! ), but I'm trying to stay in some whole foods-based parameters when I do. I figure this veg-heavy meal would be totally Health Made Simple-approved! Sooo good! That chermoula — a spicy herby, garlic oil — really set this dish off. After lunch, I showed my mom the Give a Damn! Music + Activism at Stax Records exhibition, which is currently on view in our West Gallery (through Dec. 2). Afternoon snack was another fruit bowl (pineapple, blueberry, clementine). I used my dress as a tablecloth while working from a couch in the office. And dinner was a super-fancy plate of a Dressed-Up Southwest Baked Potato! This had black beans, salsa, scallions, jalapeno, avocado, and cilantro. I added the rest of the leftover kale, mushroom, onion saute from our Sunday burritos. Mmm mmm. I'm already on week 4 of Health Made Simple! I can't believe how quickly it's going by. These meal plan things tend to drag on for me typically, but I think, since I'm not being super-strict or denying myself things, this one doesn't feel like a meal plan at all. It just feels like normal life, except with way more fruit (and way less plant meat!) than I'm used to. Sunday morning started with Avocado Toast topped with pickled onions and bagel seasoning. So good! Morning snack was — you guessed it — fruit! This bowl had pineapple, strawberries, and clementines. Lunch was a leftover brown rice bowl with kale, mushrooms, chickpeas, tahini sauce, and pickled onions. Shortly after lunch, my parents came over from Arkansas. My mom had plans to stay for a couple days to help me paint my dining room and hallway, and my dad needed to fix my running toilet and bicycle brakes. My mom and I went to Home Depot for paintings supplies and immediately got to work. 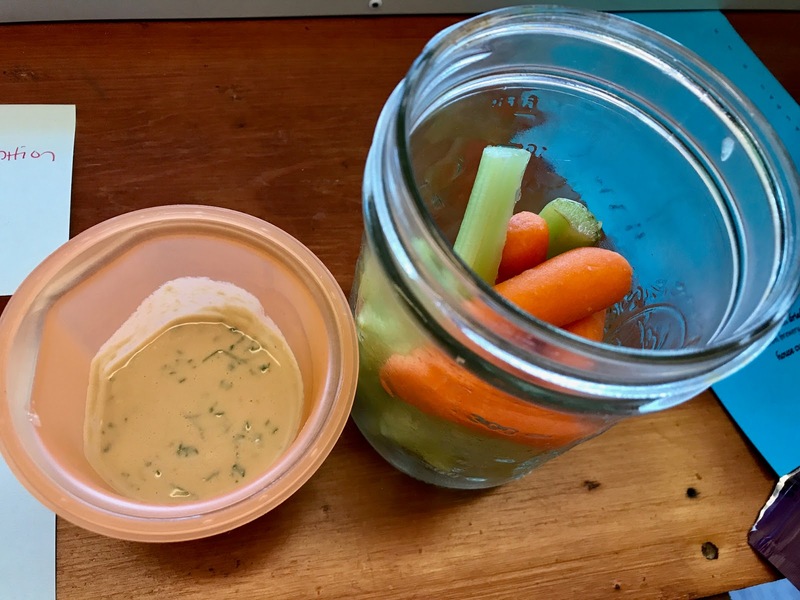 I snacked on baby carrots and celery with goddess dressing while we worked. I told my mom that, instead of grabbing takeout for every meal while we painted, that I'd be cooking Health Made Simple meals. 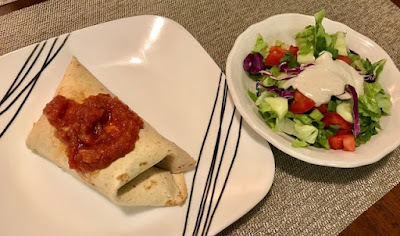 She was totally down for that, so while she kept painting, I stopped to prep us some dinner — Black Bean Burritos with Salad. 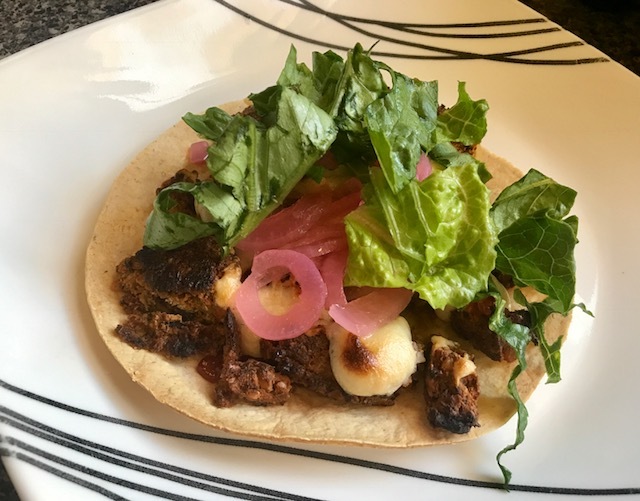 These had black beans, kale, mushrooms, onions, guac, salsa, lettuce, pickled onions, and tomato. My salad had cashew ranch, and she opted for a bottled carrot ginger dressing. Sorry for the crappy photo, but we had no time to waste on food styling. We had work to do! 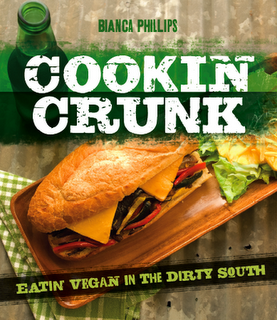 Sadly, I FORGOT to add brown rice to our burritos! Still good though. Oh, and those wraps are whole wheat and made with very few ingredients (unlike the highly processed Mission ones). They're by La Tortilla Factory. My new fave! We wrapped up painting around 11 pm, enjoyed a glass of celebratory red wine, and went to bed. And then we woke up bright and early on Monday morning to get back to painting. I took the day off work, and my mom is on vacation all week. 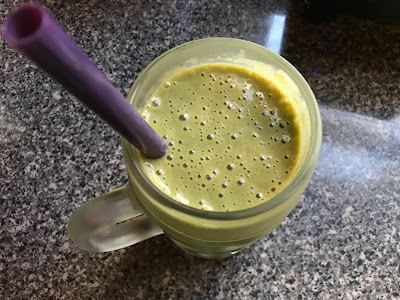 My meal plan recommends smoothies every week day for breakfast and solid meals on weekends. But they say oats are a perfectly fine alternative if you'd rather have that. My mom burned herself on smoothies a few months ago when she did a reset plan that involved smoothies for every meal. So she was much more in favor of Steel Cut Oats over smoothies. I added a mashed banana and maple for sweetener and topped with blueberries, strawberries, and walnuts. Mid-morning, we both snacked on fruit bowls with banana, clementines, and grapes. And then for lunch, we had leftover Black Bean Burritos (with rice this time!). Plus, I made us some Air-Fried Potato Wedges on the side. As you can see, I had paint all over my hands (and my legs and my arms and my face!). In the afternoon, I snacked on some trail mix, but I forgot to take a picture. Around 5 pm, I pulled away from painting (while my awesome mom soldiered on!) to prep dinner again. 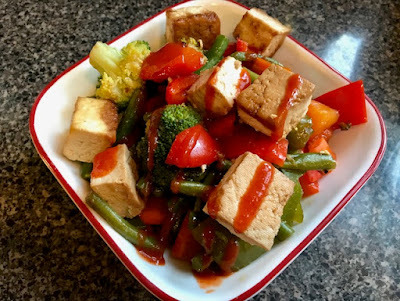 This time, we had Marinated Baked Tofu & Veggie Stir-fry over Quinoa. 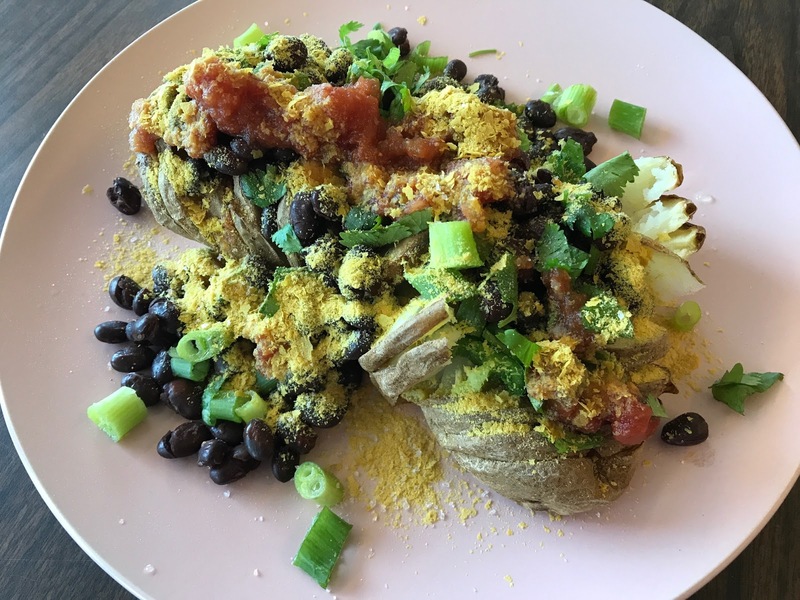 This meal plan recipe was one of my faves so far! The tofu is marinated with soy sauce, maple, and garlic and baked in the oven. The veggies — broccoli, carrots, and green/red bell peppers — are fried without oil and seasoned with a maple-soy sauce that's thickened with cornstarch. My mom loved this too! After dinner, it was back to work for a bit! And then, finally, around 9 pm, we called it quits for the night and enjoyed a couple glasses of wine while watching Queer Eye on Netflix. What an exhausting but rewarding weekend! I'm soooooo grateful that my mom gave up part of her vacation to help me paint (and real talk, she did most of the work!). She spent the night again on Monday, so she'll come up again in tomorrow's post. 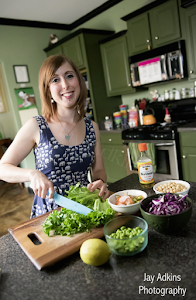 I'm well into the third week of the No Meat Athlete Health Made Simple plan, and I'm feeling better than I ever have on a meal plan. I always feel good when I'm doing a reset and eating whole, plant-focused meals. But this plan has a very specific emphasis on your "most of the time" (or MOTT, as HMS nutritionist Sid Garza Hillman calls it). That means, I don't need to feel guilty when I skip a meal plan meal and have a dinner out with friends or a cocktail at a bar or a slice of vegan cake. As long as I'm eating well most of the day, those things are totally fine. 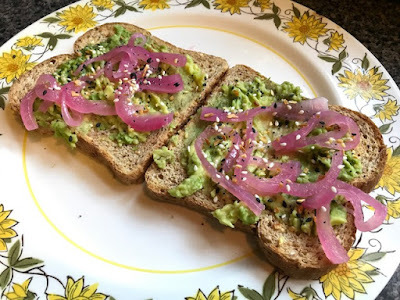 Anyway, here's what I've been eating on the plan (and off the plan!). On Thursday (Day 18), I started with another Blueberry Peach Smoothie (following an hour-long gym session with spinning, elliptical, and weight machines). 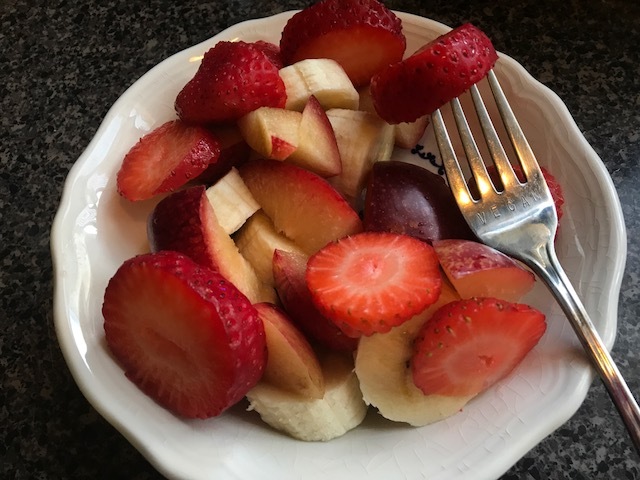 My morning snack was another fruit bowl (I eat these every day on the plan!). 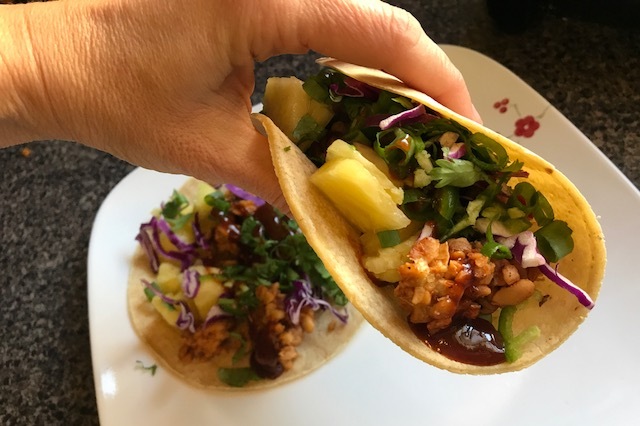 And lunch was leftover BBQ Tempeh Tacos with pineapple, cilantro, scallion, and jalapeno. Afternoon snack was Baked Corn Chips and Salsa. They recommended Garden of Eatin' baked corn chips, which I know I've bought before at Whole Foods. But they apparently don't carry them anymore. So I just baked my own chips in the air fryer using corn tortillas. I brushed with a little oil and seasoned with salt, garlic, and onion powder. Way better than storebought anyway! Dinner was Red Lentils & Red Rice and a salad with cashew ranch. The recipe called for brown rice, but I was out, so I used red instead! This was a fun, quick Indian-style meal. Breakfast on Friday was another Strawberry Raspberry Smoothie (after my early morning spinning class). I'm also doing some new foods for pre- and post-workout (before the smoothie), but I'll save that for another post. My morning snack was cut veggies (carrot, celery, bell pepper) with cashew ranch. And lunch was leftovers of the above red lentils and rice. I enjoyed my daily fruit bowl in the car while driving to Jonesboro to visit my parents. My birthday was last Tuesday, but I'd yet to celebrate with my parents. So we did birthday dinner on Friday night. My mom made Spaghetti with Vegan Beef, Mushrooms, and Vegan Parm with Garlic Bread. And we had Side Salads. I requested whole wheat pasta, so this was actually pretty healthy. And having the vegan beef and parm felt like a real treat, which is how I'd prefer to enjoy those things going forward. We also enjoyed a treat of my dad's homemade peach wine! 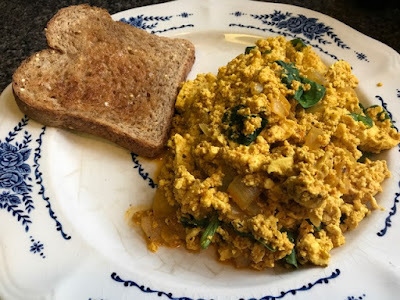 On Saturday morning, I woke up early and made my meal plan breakfast of Tofu Scramble with Sprouted Grain Toast. Yum! I spread my toast with coconut oil instead of my usual Earth Balance. After breakfast, I went to yoga and then had my morning snack of a Blueberry Peach Smoothie. Since I'd eaten at my parents' house the night before, I didn't have my leftovers for lunch. Sid and Matt recommend having a Giant Salad when you don't have leftovers for lunch, so I did just that — with Sid's amazing cashew ranch! This had kidney beans, romaine, kalamata olives, carrots, cucumbers, bell peppers, radishes, scallions, toasted pine nuts, and pumpkin seeds. Afternoon snack was another fruit bowl. Dinner was especially delicious — Rice Bowl with Sauteed Kale, Mushrooms, Onions, and Chickpeas with Goddess Dressing, Pickled Onions, & Toasted Sesame Seeds. I always feel good about myself when I have a bean/grain/green bowl! 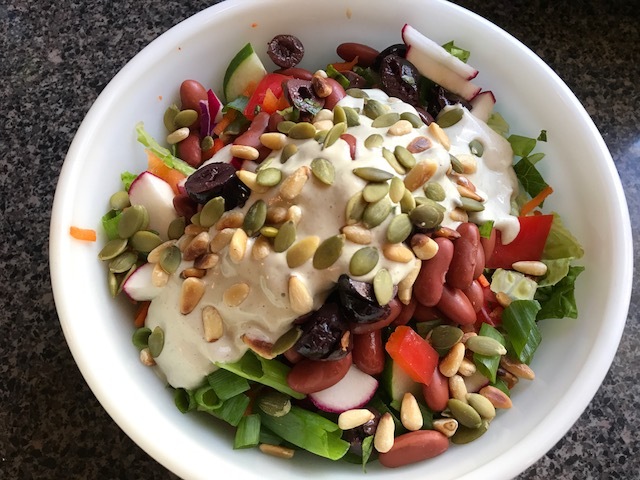 The tahini-heavy goddess dressing is another oil-free dressing on the meal plan that I'll have to keep in my regular rotation, post-reset. It has scallions and parsley mixed with tahini, lemon, ACV, and garlic. So good! Later that night, my friend Autumn was having her 40th birthday party at Atomic Tiki, a tiki bar down the street from my house. I am definitely still enjoying the occasional drink on this meal plan, because it's not my MOTT but instead my "some of the time." I had two delicious craft beers there. And I was just about to leave (because it was almost midnight! ), when my vegan baker bud Stephanie brought out these Vegan Peanut Butter Bomb Cupcakes! These are my personal fave of hers, and she hasn't made them in a couple years. It's a chocolate cupcake with peanut buttercream that's dipped in a creamy chocolate ganache. I knew eating a cupcake at midnight was crazy, but it's certainly not something I'll do every day. So I enjoyed one — down to the very last bite. 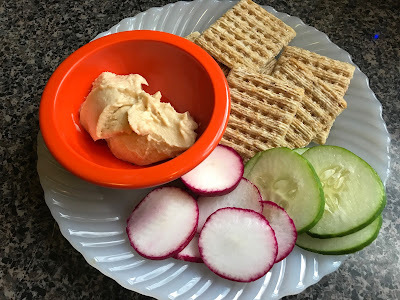 Health Made Simple, Day 15! Bagels & Oats & Soup!